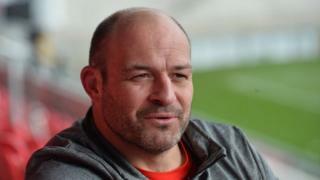 The cost of a freedom of the borough ceremony for Ireland rugby captain Rory Best, which amounted to nearly £40,000, has been described as "extortionate". The award was conferred by Armagh City, Banbridge and Craigavon Council at an event last September. The total cost was revealed by campaign group, Save Craigavon City Parks and Lakes. A council spokeswoman said Best "is a great ambassador for the local community". A freedom of information request revealed that the total cost of hosting the ceremony was £39,759.56. The final bill included £14,442.50 for venue and equipment hire, £14,221.50 for catering, £4,131.50 for design, printing, stationery and venue dressing, and £2,835 for a freedom scroll and book. The freedom of the borough event was held at the Archbishop's Palace in Armagh. It is understood a marquee was hired for the event. Kelly Laverty, a spokeswoman for Save Craigavon City Park and Lakes, said she did not object to Best being granted the award, but said the cost was "extortionate". "That is two people's wages for a year," she said. "Why could the mayor not have presented that award at the civic centre? "The council has spent £14,000 on venue (and equipment) hire, and we have the civic centre and various other venues that could have been used." Ms Laverty said the council needed to address "style over substance" spending. "We have an area of high social deprivation in Craigavon, and we are spending nearly £40,000 on a party," she added. "There are people living in food banks struggling to pay their rates." In a statement, a spokeswoman for Armagh City, Banbridge and Craigavon Borough Council said the "award of freedom of the borough acknowledges the contribution of organisations or people to the life of our area which is rarely assigned and represents the highest civic honour that can be bestowed". She added that councillors "representing every area of the borough unanimously agreed" that Mr Best deserved recognition for the contribution he has made locally, nationally and internationally. The spokeswoman said Mr Best brought "great pride and honour to our area throughout a long and distinguished career and in acknowledgement of this, a fitting tribute was supported by all councillors". "A great ambassador for the local community, Rory is patron for the Portadown Panthers, a non-contact tag rugby club for people with learning disabilities, members of which came together to participate in a Festival of Rugby organised by City Of Armagh Rugby Club on the morning of the event and which featured teams from right across the borough," she said. The council said it was "delighted" to work with BBC Northern Ireland as part of a planned documentary on Best and his career, which incorporated the event. Earlier this month, it emerged that the total spend on conferring the freedom of the borough of Armagh, Banbridge and Craigavon to former Portadown Football Club manager Ronnie McFall in 2017 was £15,458.26. He was chosen to receive the council's first ever freedom of the borough award. The council, which is one of the largest in Northern Ireland, said that a notice of motion was passed unanimously to grant the freedom of the borough to Mr McFall for the "significant contribution he has made to sport in the borough and in NI". In February of this year, the Belfast Telegraph reported that councils in Northern Ireland had spent more than £600,000 on awards ceremonies in three years. Armagh, Banbridge and Craigavon Council had a bill of £162,188, and topped the list of the 10 out of 11 councils in Northern Ireland whose spending was featured in the report published by the Taxpayers' Alliance.